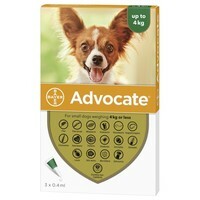 Advocate Small Dogs for dogs weighing less than 4Kg (Advocate 40) contains 0.4 ml (40 mg imidacloprid, 10 mg moxidectin) and is a broad spectrum combination treatment, effective against fleas, flea larvae, roundworms, hookworms, whipworms, heartworms and Sarcoptic mange, ear and Demodex mites. Advocate Small Dog gives you proven flea and flea larvae control as well as effective control of intestinal nematodes, heartworm and mites. Use Advocate monthly. Not to be used in puppies under 7 weeks of age. Exactly what I get from the vet at a fraction of the price. Even when the cost of a prescription is added it works out cheaper. Will be getting again.